Cap'n Cardalino reports "Really enjoyable game of Hockey tonight at Leicester, an entertaining 4-4 draw and some great goals from John Kane, Chris Sampson and Dafydd Bowles (guesting tonight) .. a good job Leicester gave us a keeper and maybe drinking port wasn't a great idea at half time because we let in 2 goals in the first 5 minutes of the second half . Yet again Steve Lycett manages to influence a match". "A game that everyone who played in should be rightfully proud. It}s not always about winning, but how you play as a team and we really did! Rugby brought some skillful youngsters and a brute of an adult at the back who clearly hadn’t read the rules about adult conduct and who claimed at one point that he didn’t realise it was a Badgers game! Not to worry, to a player everyone gave 100% throughout the game (thanks to Tristan’s eagle eye on rolling on and off our substitutes) and it wasn’t until the second half that Rugby’s skill and pace began to tell and they scored their winning goals. But we didn’t stop battling and Imogen scored a tenacious goal in the face of much barging and buffoonery tactics from the brute at the back. Top work. Special mention goes to: Freddie for his darting runs and attempt to ‘skill’ the whole team until he had to let go of the ball on the edge of their ‘D’ (as he’s now classed as an adult), to Taz for some great saves and his incredible bravery in running out to kick away a ball and was flattened for his efforts much like a pancake, to Ed and Becca at the back who really got stuck in, tackled hard and made it difficult for their attackers to get around them, to Grace who showed great composure in reading the game and who gave some great passes up field, to Millie and Alex who showed glimpses of poise and ability to control the ball then pass it on to fellow team mates, to Will who was our ‘odd job man’ playing all over the field in different positions adapting well each time, to Charlie who came so close on a number of occasions in front of goal, eventually you will get your just rewards, to Harry and Matty (much like the Brownlee Brothers) who didn’t stop running all game and gave it their all, to Imogen for some great runs and positional play and a well taken goal! Finally, to Chris and Nick our umpires who put up with just one bellow from the Senior Herd playing in midfield. Apologies! Well done everyone for a top performance, the win will come and thank you to our doting parents for their superb sideline support". 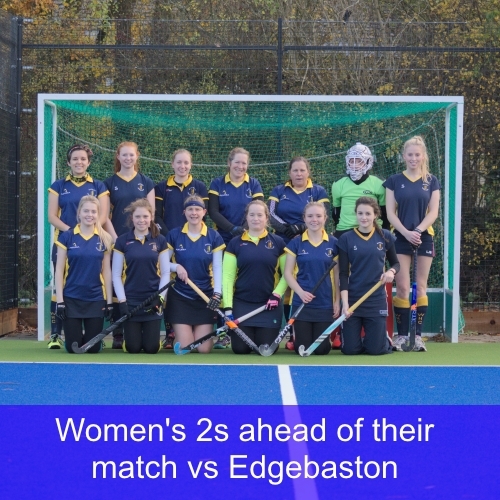 Seb reports "1s draw 2-2 after going 2 down away at Edgbaston, goals from Aly and Dave earn us a well deserved draw." Izzy sends in "a disappointing 1-0 loss against Kettering, although an overall good team performance. Hopefully next week it will pay off!" Ange sends in "Defended well but need to improve our attacking play" after a tough 0-3 loss. Check out our gallery for some match photos. Langers reports "Nice 3-1 win at home and it could have been more, that said, we relied on some good saves from mike Howard in the first half too. Goals from Chris Langley, Nick Baker and John Kane sealed the result. Emlyn Evans celebrated the arrival this week of his new son with a strong performance in midfield. POTM was Simon Shepherd this week". Nick writes "4s travelled with a bare 11 for a 4:30pm pushback at Harborne, captain Nick Anscomb acting as stand-in keeper doing well to keep the score to only a 2-1 loss." Sharon reports "Ladies 4s drew 1-1 after dominating the entire game and conceded by last minute short corner." Claudio sends in..."5th team report Northampton 5ths 6 Warwick 0.... after 20 minutes it was difficult to see either side score 6 but some how the 5ths hit the self destruct button and imploded .. John MacDonald playing goal kept the score below double figures and Ian MacDonald gave a man of the match performance as captain and rear gunner ..At times it was the Alamo and at other times it was Keystone cops ..."
Chris Langley reports "Well worth the one hour road trip to see our boys put on a fine display of skill and quality team effort against strong opponents. Fast paced from the start, Telford had the upper hand in the first exchanges and forced the first goal with some determined individual skills. Warwick responded brilliantly with a switch move left to right finding James Langley whose driven pass into the D found Alp. With almost a single movement Alp controlled the ball and fired a reverse stick smash shot past the helpless keeper; 1-1 at half-time. Warwick's determination and skill in all areas of the pitch gradually took control of the second half, goals from Oli Hobbs, Ben Cooper and a 2nd for Alp made it 4-1 with Warwick dominating the last 10mins. As the game drew to a close Warwick won a short corner as the full time whistle blew, a neat slip move set up Oli for his second and a final score 1-5. The entire squad all performed brilliantly POTM was awarded to Oli Hobbs. 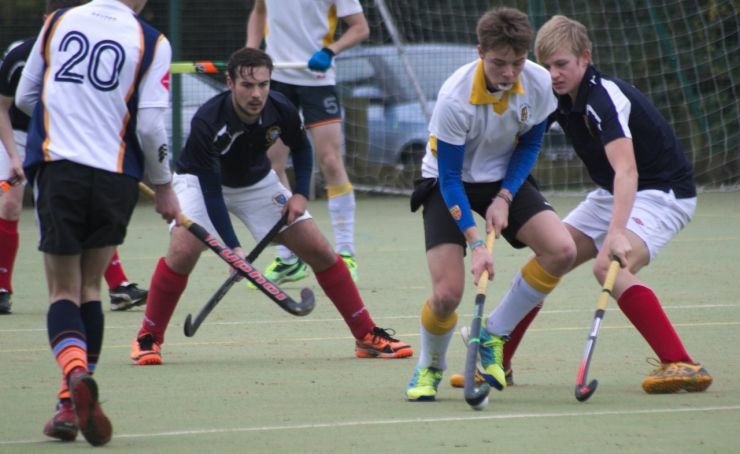 Round 3 of the EHB Cup done, round 4 (last 16) here we come on 5th February!